What led you to pursue an internship at the Rancho? Growing up I had volunteered and worked in different museums around Los Angeles County. I fell in love with the museum environment and knew that was the career path for me. My professor from CSULB, Dr. Cleary advise me to apply for the curatorial internship. 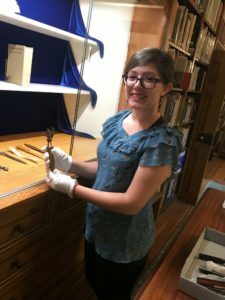 It sparked immediate interest for me because I wanted to gain curatorial experience and being able to utilize the historical skills I learned in school. What were some of the tasks you did while interning here? Throughout my internship I was assigned various task and assisting the curator, Sarah FitzGerald. My primary tasks was to do historical and contextual research related to exhibit displays and was fortunate to write a panel for the Tibahangna to Today Exhibit that will be in display beginning late September. I also photographed items of past exhibits, maintain clean exhibit spaces, attended several staff meetings, assisted the textile committee on evaluating and reporting the conditions of RLC textile collection, transferred data onto Past Perfect (museum collection management software), assisted in some events and designed my own exhibit display in the library. What were you most surprised about during your internship? What surprised me the most was the diverse and rich history the site has to offer and learning behind-the-scenes of how the museum operates. Sarah FitzGerald encouraged me to work with several staff members to gain a comprehensive understanding of each department of the Rancho. It was insightful to learn about the amazing collaboration and talent that the RLC staff offers to the museum and the community. This is a tough question to answer since I enjoyed every moment of this internship, I always learned something new each day. Creating my own display, handling artifacts and exploring through the museum’s collections are definitely highlights of my internship but my favorite part I’d say is having the privilege in doing research and writing a panel for Craig Torres, a cultural Tongva educator, family history and the importance of oral history that will be on display in the upcoming exhibit. What was the most interesting artifact you came across while working on exhibits? The rancho has amazing artifacts in their collection but the most interesting artifact I came across were these paper knives that I displayed in the library’s exhibit. What stood out to me were their unique designs and the fascinating history behind their invention. My hobbies include reading, writing, hiking, making jewelry and collecting postcards. Currently, I’m in the process of gathering my family’s history by conducting interviews with family members and transcribing them to preserve my family history. I feel that it is important not just for me but for my nieces and nephews to know their cultural background and develop a strong sense of self-identity. What are your plans after completing your internship? The curatorial internship has been very rewarding since I have a professional interest in this field. I want to continue working and volunteering in history museums and historical sites so I can strengthen the skills I gained from Rancho Los Cerritos. I want to continue my education in graduate school and pursue a Master’s Degree in Museum Studies. Overall, Rancho Los Cerritos has helped gain insight on the importance of history, the arts and culture within my community and the ability to apply this knowledge for future careers. 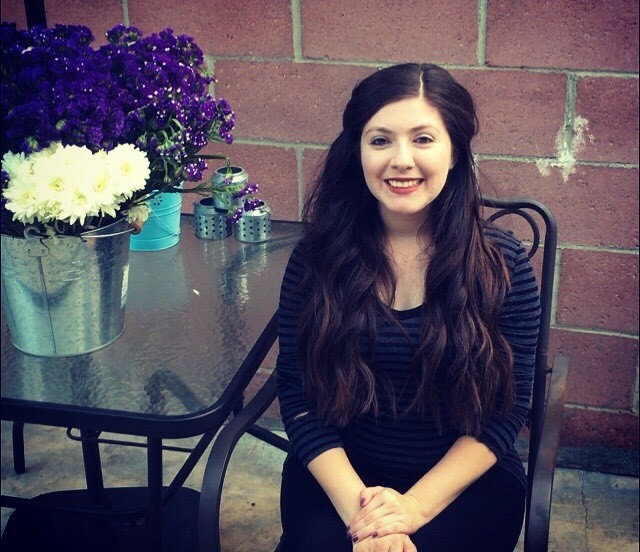 After completing her internship, Andreyina Juarez was hired into a permanent staff position at Rancho Los Cerritos. She now works as an administrator in our development department.